Recent years have seen tremendous and accelerating increases in demand for data networking capacity with carriers and in enterprises. The multiplication of mobile and connected devices, the proliferation of streaming video-based applications, and now the internet of things (IoT) will only increase the challenge of delivering capacity and ensuring quality as data moves from web to mobile to machines. The challenge is even greater for companies seeking to protect data, infrastructure and identities by cost effectively inspecting, analyzing and mitigating cyber threats in an age of social networks, state-sponsored cyber- terrorism, automated BOT networks, and machine learning driven malware. In partnership with Fortinet, NoviFlow integrates Software Defined Networking (SDN) capabilities with Fortinet Security Fabric, effectively moving the services onto the SDN enabled network, while reducing total customer network CAPEX and OPEX. The Fortinet Security Fabric is designed around a series of open application programming interfaces (APIs), open authentication technology, and standardized telemetry data that also enables NoviFlow CyberMapper to link Fortinet’s security services and appliances directly into NoviFlow’s programmable fabric and provide end-to-end broad, automated and integrated security. 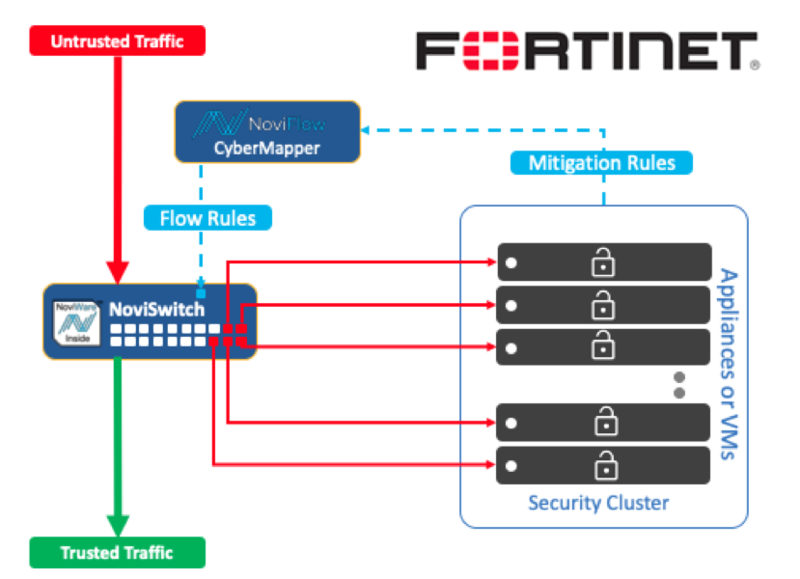 The NoviFlow/Fortinet joint solution changes the equation on the cost, performance and scalability of delivering cybersecurity by leveraging the power of SDN to implement cybersecurity as a forwarding plane function!